Our systems can be used in various fields – the Eco ice system technology offers significant advantages everywhere driving heat is available and cooling is required. With the Eco ice absorption refrigerator, temperatures can be provided below 0°C, as well as typical climate applications. This is often used in connection with a CHP to generate additional power and achieve trigeneration. Absorption refrigerators in particular benefit from continuous operation, which is typical in process technology. One of many examples is cooling parts after the extrusion and injection moulding process. Refrigeration and air conditioning applications can be carried out solely by the absorption refrigerator. 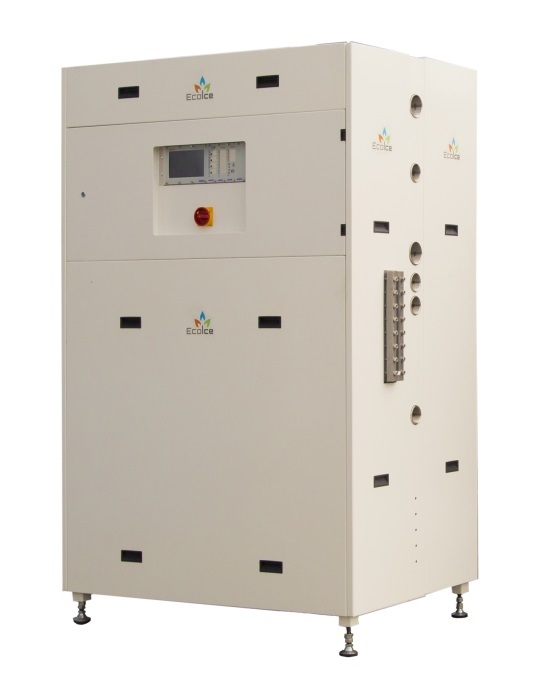 Freezing applications to about -30°C are achieved by cascading the absorption refrigerator with a CO2compression refrigerator. The use of cogeneration to generate electricity is also being discussed more and more frequently in retail. This releases waste heat at such a temperature level that it can be used to fulfil the cooling requirements with the Eco ice AKM. The refrigerant ammonia remains within the absorption refrigerator in the engine room. The refrigeration units in the retail area are supplied via a brine cycle. Conventional air conditioning systems with the typical temperature range 6/12°C often have performance problems during daily high temperatures in the early afternoons. Installing an absorption refrigerator by Eco ice reduces the operating costs of an existing air conditioning system and can also be used for loading ice banks for providing extra power at peak load. This system concept also meets frequently specified requirements for redundancy in server rooms and data centres. The absorption refrigerator by Eco ice, in contrast to many other systems which provide refrigeration from heat, easily switches between air operation and cooling operation. This allows stables to be air conditioned in summer and potatoes to be cooled to near 0°C in autumn and winter with the same system. Providing network-independent electrical energy with a CHP increases the security of supply of systems with a mains operation. In the case of a power failure, often important air conditioning and cooling applications are no longer guaranteed. A combination of an absorption refrigerator and ice storage by Eco ice ensures the fulfilment of these cooling applications with low electrical energy consumption.